Alabama Bloggers: Birmingham Fashion Week: Coming Next Week! Birmingham has been known for many industries over the years. Steel, banking, insurance, and the medical fields, to name a few. And now, thanks to the creation of Birmingham Fashion Week, we have the opportunity to be recognized as a fashion presence, as well. Not only does Birmingham Fashion Week attract incredible designers, but they offer the chance of a lifetime for local students with their Rising Design Stars Challenge. Over eighty students, ranging from 11 to 18 years old, submitted their own clothing creations made out of non-traditional materials and assembled with glue, tape, and scissors instead of stitches. Forty finalists were chosen, and were privileged to have their work displayed at the Birmingham Museum of Art in January and part of February. The top thirty designers will get to showcase their work on the runway at Birmingham Fashion Week! 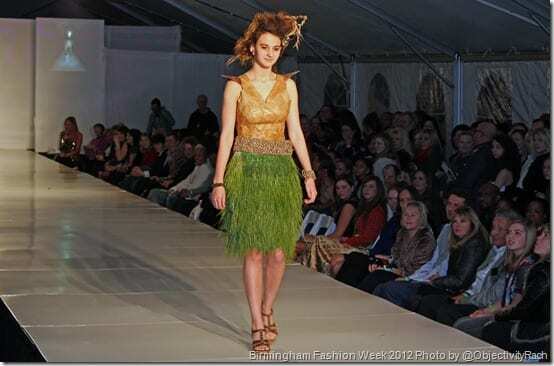 Birmingham Fashion Week 2013 will be located at Pepper Place from February 23 - March 2. The schedule of events is available on their website, but I would highly recommend attending either Thursday, February 28 or Friday, March 1. Jeff Garner of Prophetik will be showing on Thursday night, and not only are his clothes dream-inspiring, but his Runway Show aesthetics are like receiving the bonus of a theatrical event. And on Friday night, Project Runway All-Stars winner Anthony Ryan Auld will be showing along with runner-up Joshua McKinley. Being a committed fan of Project Runway, I am beyond thrilled to see them in Birmingham. Tickets for each night are available on the Birmingham Fashion Week website. I hope to see you there! Disclosure: Although I will be attending Birmingham Fashion Week as a member of the press, I was not compensated in any way to write this post. All opinions are my own.